Don’t expect a tough Chinese line on Iran’s nuclear efforts. Burgeoning trade will keep calls for harsher sanctions in check. For the first time, the Chinese government has indicated that it will vote in favour of another UN Security Council resolution imposing sanctions on Iran for its suspicious nuclear activities. Of the five veto-wielding permanent members of the Council, Beijing has shown the greatest reluctance to adopt additional sanctions on Tehran, perhaps not surprising considering China buys a considerable amount of Iranian oil and sells the Islamic Republic refined gasoline as well as conventional weapons and consumer goods. Indeed, Beijing only consented to the latest round of sanctions after the draft resolution largely left these unaffected. It’s clear that any discussion of Chinese-Iranian relations needs to start with an acknowledgment that Iran has become one of the most important sources of foreign energy for the People’s Republic of China, supplying Chinese consumers with as much as 15 percent of their imported oil in some years. China’s state-owned companies have established important stakes in Iran’s oil and natural gas sectors and have sold Iranians diverse commercial and military products. Thanks primarily to the growing value of these energy-related exchanges, China-Iran trade has been increasing by an average of 30 percent annually in recent years (according to Beijing’s calculations, bilateral trade reached $27.6 billion in 2008, an increase of 34 percent over the previous year). As a result of this, China became Iran’s largest trading partner, responsible for about 14 percent of its imports and exports, in 2008. In 2009, the global financial crisis and the decreasing world price for oil resulted in this falling to $21.2 billion, although according to the latest figures, during the first three months of 2010, two-way trade between the two jumped by 47.4 percent from a year earlier. Iranian efforts to acquire sensitive nuclear technologies, such as the capacity to enrich uranium to manufacture nuclear fuel, have been the main factor complicating Tehran’s relations with China. 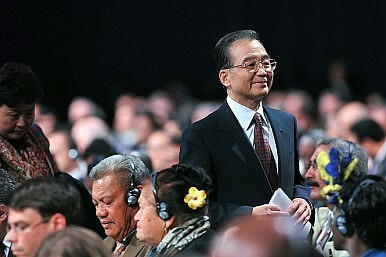 In December 2006, March 2007 and March 2008, the Chinese delegation reluctantly voted for three UN Security Council resolutions that imposed modest sanctions on Iran. They sought but failed to induce Tehran into ceasing uranium enrichment, a technology that could also be used to make nuclear bombs, and into making its nuclear activities more transparent to the International Atomic Energy Agency. Throughout this process, Chinese diplomats, in partnership with their Russian colleagues, have worked to weaken the proposed sanctions. In addition, they’ve consistently defended Iran’s right to pursue nuclear activities for peaceful purposes, such as civilian energy production. Even so, Chinese leaders have made clear they oppose Iran’s obtaining of nuclear weapons, a development that could inflame tensions in the Middle East—the source of approximately half of China’s oil imports. Meanwhile, Chinese officials have repeatedly called on their Iranian counterparts to demonstrate flexibility in the nuclear negotiations.